They are: who (whose, whom), which, that, as. I. A relative pronoun joins to its antecedent a subordinate clause that relates something about the person or thing represented by the antecedent. The man whom you saw is my father. II. A relative pronoun is always found in an adjective clause. Laws which are unjust should be repealed. 1. 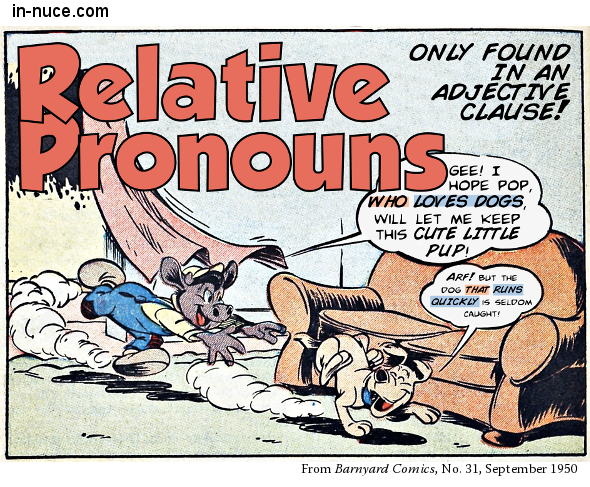 A relative pronoun connects an adjective clause to the noun or pronoun that the clause modifies. On either side are pavements that are from six to eight feet wide for pedestrians. IV. Relative pronouns are either simple or compound. As, used to take the place of who, which, or that, after the words such, much, many, and same. 2. The compound relatives are formed by adding ever, so, and soever to the simple relatives. Whichever way you may take will lead to the city. I am pleased with whatever you may do. 2. Is it relative, and why? 5. Gender, person, and number? The horse which you sold me is lame. The boy closed the shutters, which darkened the room. “Whoever” is a pronoun; relative; compound; it is equivalent to he who, or any one who — “he” being the antecedent part, and “who” the relative. Parse “he” as a personal pronoun, subject of “will learn,” or “one” as a “pronominal adjective used as a noun,” subject of “will learn,” and “who” as a relative, by preceding models.